In response to a YouTube video Tweet from fan Steve Smallwood [ https://twitter.com/stebullmiester ], Survivors (2008-2010) cast members Phillip Rhys (Al Sadiq), Julie Graham (Abby Grant), Robyn Addison (Sarah Bowyer), Max Beesley (Tom Price), Zoe Tapper (Anya Raczynski) and locations manager Andy Morgan briefly discussed the enticing possibility (however remote, at present) of a return for the show for a third series. @RobynEthel @stebullmiester @maxbeesley7 @zozotaps you didn't die. It was a dream!! @stebullmiester got a lovely email. Dead chuffed. He's still got all the story ideas for 3rd series..you never know. A plan may be hatched! The third season of alien-invasion post-apocalyptic TV drama Falling Skies premieres on the FOX channel in the UK at 21:00 on 16 July 2013. Steven Spielberg’s sci-fi epic Falling Skies, starring Noah Wyle, is back to invade our TV screens on Tuesday 16 July at 9pm First on FOX. Last season, you witnessed the 2nd Mass battle a whole new breed of otherworldly creatures as they embarked on a desperate mission to defeat the Overlord and thwart the alien operations altogether. However, they soon came face-to-face with an even bigger threat. As the new season opens, seven months have passed since the survivors of the 2nd Mass reached Charleston, which has been named capital of the New United States. Writing on the SuperTechBlog site (18 January 2013), Colton Kaiser claims an ‘exclusive’, reporting that the streaming online film and TV company Netflix is in active talks with the BBC about commissioning a new, third series of Survivors. In recent months, Netflix has begun to commission both new and returning episodic dramas, which will by-pass international TV networks entirely and be made exclusively available throughthe web-based Netflix service. The first original drama series to be commissioned by the company was House of Cards, a dark political drama produced by David Fincher. Netflix has since announced a slate of new commissions, including a new series of the previously-cancelled comedy Arrested Development. Some reports suggests that Netflix has already commissioned its first British drama, but confirmed details are scarce. Although the speculation is intriguing, What the report on SuperTechBlog omits entirely is that the BBC are not the only party with which Netflix would need to agree terms. As lead scriptwriter, producer and Survivors showrunner Adrian Hodges would hold rights in a number of the characters, characterisations and storylines any new series would need to pick up. More fundamentally, any new commission by a third party would require a fresh negotiation with the estate of Terry Nation to licence the right to use the original characters and premise. However, the speculation is itself interesting – and this blog will continue to follow the story closely as either it evolves, peters out or is proven to be completely mistaken. In the meantime, if you come across any confirmation or refutation of any part of the story, please get in touch via the Contact form or leave a Comment on this post. Who would you say is responsible for the cancellation of Survivors? To mark the arrival of 2013, a quick (unscientific) poll on the the question of responsibility for the cancellation of Survivors. Please vote by making a single choice; and add whichever additional thoughts you have in the Comments section (Note: to prevent spam and abuse, comments are moderated before publication). 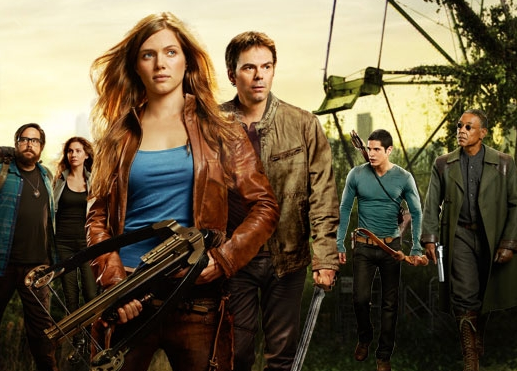 In the UK, Survivors may have been cancelled after two series, and Outcasts after just one, but in the US post-apocalyptic TV drama is continuing to enjoy an unexpected (and diverse) renaissance. New dystopian, post-apocalyptic TV drama Revolution premieres in on NBC (in the US) on 17 September 2012. Created by Eric Kripke, and produced by Kripke, J. J. Abrams and Bryan Burk, Revolution is set in a near-future America, 15 years after a blackout (the cause of which is unknown) cut off all electric power, and brought modern civilisation to an end. The series focuses on the travails of the Matheson family, in a fractured, lawless and dangerous America now thrown back into a pre-industrial era. What would you do without it all? In this epic adventure from J.J. Abrams’ Bad Robot Productions and Supernatural‘s Eric Kripke, a family struggles to reunite in an American landscape where every single piece of technology – computers, planes, cars, phones, even lights – has mysteriously blacked out forever. A drama with sweeping scope and intimate focus, Revolution is also about family – both the family you’re born into and the family you choose. This is a swashbuckling journey of hope and rebirth seen through the eyes of one strong-willed young woman, Charlie Matheson (Tracy Spiridakos, Being Human), and her brother Danny (Graham Rogers, Memphis Beat). When Danny is kidnapped by militia leaders for a darker purpose, Charlie must reconnect with her estranged uncle Miles (Billy Burke, The Twilight Saga), a former U.S. Marine living a reclusive life. Together, with a rogue band of survivors, they set out to rescue Danny, overthrow the militia and ultimately re-establish the United States of America. All the while, they explore the enduring mystery of why the power failed, and if – or how – it will ever return. ‘About Revolution’. NBC.com. http://www.nbc.com/revolution/about/. 16 September 2012. A 4min 21s preview (containing lots of ***spoilers***) for Revolution is available to watch (in the UK, as well as US) – and has already secured close on 9m views on YouTube. Meanwhile, the third (sixteen episode) series of critically-acclaimed zombie drama The Walking Dead premieres in the USA on October 14 2012, and will be broadcast in the UK on the FX channel (transmission dates still to be confirmed). In addition, broadcast of series two of alien-invasion drama Falling Skies concluded on the FX channel in August 2012. As previously announced, a third series of Falling Skies has been commissioned, and production is now well underway, with broadcast in the US and UK assured. Earlier in the year, the Digital Spy site reported that streaming film and TV rental specialists NetFlix were in discussion to revive cancelled US post-apocalyptic drama Jericho, following a strong rental showing for the CBS drama. in the aftermath of a global event that devastates the world’s infrastructures, [following] a small band of survivors striving to rebuild society and unravel the mysteries of why the event took place and what the future has in store. Told from the point of view of an eclectic group of neighbors in a Van Nuys, California apartment building, this journey of survival will show us that hope is found in the smallest of victories and heroes are born every day. From executive producer/writer Jesse Alexander (Heroes, Lost, Alias) and director Alex Graves (Fringe) comes this epic adventure that starts on Day One. A pilot episode of a proposed 13-episode series was filmed, but the NBC network then opted to truncate the drama (first to a mini-series and then a standalone TV movie). It now appears that the ‘pilot’ of Day One will never be transmitted. A rare opportunity to enjoy an episode from the original Survivors on the big screen is provided during the ID Fest film festival in Derby later in May. The series three episode Law of the Jungle, which features a memorable guest appearance by Brian Blessed is being screened on Saturday 26 May at 12:45pm. The ‘Brian Blessed Television Showcase’ also includes an equally rare cinematic outing for one of the earliest installments of the Tales of the Unexpected anthology Lamb to the Slaughter, in which Blessed also co-stars. At 7:00pm on the same day, the festival plays host to Brian Blessed: live in conversation, an opportunity to hear the actor and raconteur reflect on decades of work on the big and small screen. Blessed’s appearance is followed by a screening of the kitch 1980s space-opera Flash Gordon, which features a scene-stealing peformance from Blessed as Prince Vultan. Tickets for the Brian Blessed Television Showcase and Brian Blessed: live in conversation events are available from the Quad venue web site. Interestingly, [show creator] Ben Richards says that the first series [of Outcasts] will end “on a series of cliffhangers affecting some of the key characters”, something that should – in theory – guarantee a second series. Why? Because earlier this year Ben Stephenson, controller of BBC Drama, announced that he had had enough of series that didn’t wrap things up to the satisfaction of the viewer. Survivors, another futuristic BBC show, is a classic case. When series two ended earlier this year – followed promptly by news that it wouldn’t be returning – Max Beesley’s character Tom Price was left high and dry in an aircraft hold, his fate unclear. Stephenson doesn’t want any more of that cliffhanging, which surely gives Outcasts a better than average chance of returning for series two in 2012 with all those cliffhangers in the final episodes of series one. Oglethorpe’s logic seems faulty – rather than feeling compelled to renew Outcasts simply because series one of the show ends with (now ‘unwanted’) cliffhangers, BBC Drama could just as easily be irritated by the fact that the producers of Outcasts are continuing to use cliffhangers as renewal leverage. More significantly, it’s also not clear that Oglethorpe has read Stephenson’s comments accurately. In a speech to the BBC Drama Autumn/Winter 2010/11 launch, for example, Stephenson celebrates one-off, short-run and single author drama – but offers no criticism of the ‘hook’ of series’ finale cliffhangers. A new web site promoting the campaign to Continue Survivors has just been launched [http://www.continuesurvivors.co.uk/Backpage.htm]. With a design based on the ‘Hope Never Dies’ postcard featured in the series two story arc, the site promotes the Survivors series three online petition; the Survivors Series 3 please BBC Facebook group; as well as this blog. The BBC FAQ which previously indicated that ‘no decision’ had been taken on the future of Survivors has now been updated to reflect the confirmed cancellation of the series. The BBC is committed to making a broad range of varied and ambitious drama, but in order to achieve this we do have to move on from some pieces in order to allow new work to come through. After two series, Survivors will not be returning. Many fans of Survivors are registering their displeasure at the cancellation of the show through the BBC’s online contact form. Then complete the remaining mandatory fields, and add your comment about Survivors‘ cancellation. Please continue to add comments to this blog, and to the ‘Wall’ on the Survivors series three please Facebook group. The Total SciFi site reports ‘exclusively’ that the Survivors production team has learnt that the BBC will not be commissioning a third series of the show. Total Sci-Fi has learned that the BBC has decided not to commission a third series of Survivors, the reinvention of Terry Nation’s 1970s post-apocalyptic series. “Sadly the BBC aren’t going to do any more Survivors,” a source close to the production told Total Sci-Fi. “They expressed genuine affection for the show and a real desire to go again but felt that with the ratings having slipped a little since the first series they couldn’t take the risk. The sad truth is that we’re somewhat the victims of having gone out on the main channel – in some ways the exposure is wonderful but in other ways it’s a mixed blessing. The source added that the cast and production team felt they had “truly begun to hit our creative stride in series 2” and were upset at not getting the chance to develop the series further. It has not been confirmed at present whether there will be a third series. As soon as the BBC has confirmed its intentions in respect of Survivors series three, news will be posted here. A Facebook group to lobby the BBC to commission a third series of Survivors has now been launched by Andy Priestner.